Searching for some great listening material to motivate, inspire and help take your life to the next level? Looking to improve your life, boost your finances or find your next adventure on those boring commutes? Look no further than an app called Otto Radio. The company’s mission is to help fill your commute and other activities with bold, fresh and new ideas by providing easy access to the podcasts and audio news that matters most to its users. After all, it’s possible to turn downtime into valuable time that can change your life for the better. “You should always have the opportunity to have something great to teach you, make you laugh or simply add value to your life,” said Saulo Marti, vice president of marketing at Otto Radio, who spoke to RewardExpert. Otto Radio’s big advantage is that it offers its users complete and total personalization of the podcast world. That means no more hunting around for the podcasts that interest you the most. No more fumbling in the car to find that thrilling podcast that makes your time in traffic feel like a breeze. “We want you to make the most of your listening time and help you get there,” said Marti. Otto Radio allows a user to listen to their favorite podcasts with a tap of a button. Its algorithms are tailored to help a user find their favorite podcasts and discover new ones based on their preferences and history. “I believe our handpicked selections/collections and our algorithms do a great job of helping you discover amazing content,” stated Marti, who adds that discovery of new content is the number one challenge facing podcast listeners. In addition to algorithms, Otto Radio focuses on the human touch. “We’re human and we love to make these recommendations based on people’s interest,” he said. 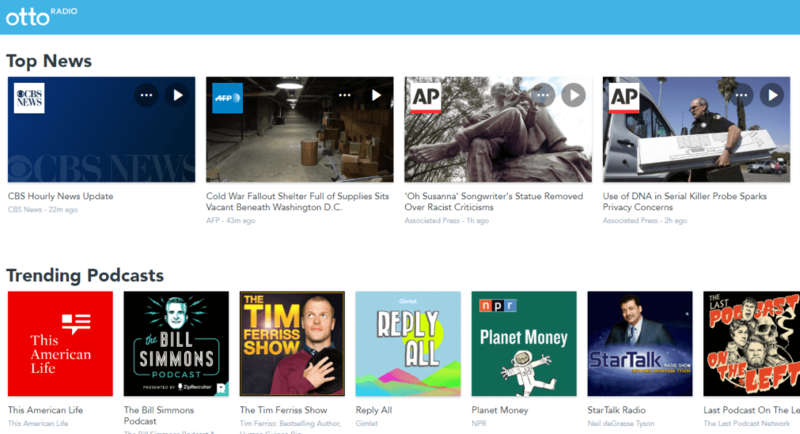 Otto Radio scans more than 1,000 news sources and over 35,000 podcasts to create your personalized podcast station. The categories are varied and include news, sports, education, fitness, healthcare, movies, music, entertainment, technology and of course, business and finance. “We offer pretty much every financial podcast,” explained Marti. As for the most popular categories, he stated that “true crime is very popular, so are financial and startup podcasts in certain regions, and comedy is always huge.” For instance, if a user prefers news, they can simply turn to Otto Radio’s “All News Radio” channel, which broadcasts continuous selections from various news outlets. In addition to podcasts, Otto Radio has a vast selection of audio books, allowing users to have their own personalized library on the go. More than 50,000 audio books are available on all sorts of topics. “We want you to make the most of your listening time and help you get there,” said Marti. Podcasts have been taking off, and in the past few years they have become a mainstay of the digital age. According to Edison Research, 112 million Americans listened to a podcast in 2017, up 11 percent from 2016. And Otto Radio is very bullish on opportunities going forward. Marti said the podcast market is not oversaturated and is in fact just at the tip of the iceberg. “It’s become so popular because it’s one of the best mediums to allow you to multi-task. If you think about it, it’s the only true medium that also gives you the ability to do other tasks at the same time (such as driving, cooking, cleaning, etc. ),” he said. Otto Radio believes that audio is the medium to connect the world both today and in the future. The company has ambitious growth plans. “There are great things coming,” noted Marti. To find great things in the audio landscape, head to www.ottoradio.com or download it for your smartphone or tablet today.